1. It is by way of a military dictatorship regime and is completely illegitimate to democratic principles and values. It is abundantly evident that General Prayuth Chan-ocha, along with other military leaders, had effectively assisted the Bangkok-shutdown rebellious group called PDRC, led by its Secretary-General Mr. Suthep Tueksuban, in order to legitimise a military takeover and to have overthrown the people’s government. 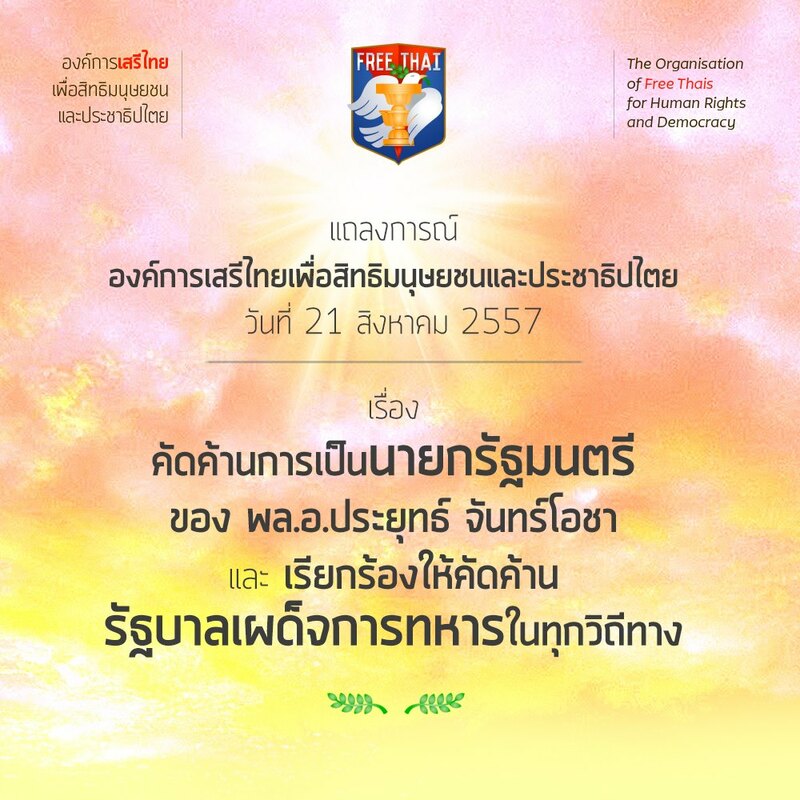 Since the coup d’tat on May 22, 2014, General Prayuth, in the name of NCPO or the National Council for Peace and Order, has clearly indicated his intention to reverse democratising Thailand to a state of military dictatorship. He has not indicated any desire for democracy and democratisation. For instance, the self-made constitution, numerous and continuing illegal arrests and violations of basic human rights, threatening people and members of the mass media for exercising free speech, the self-appointed members of the so-called “National Assembly”, and the scrapping of the local electoral structure which the entire democracy has been based upon. 2. 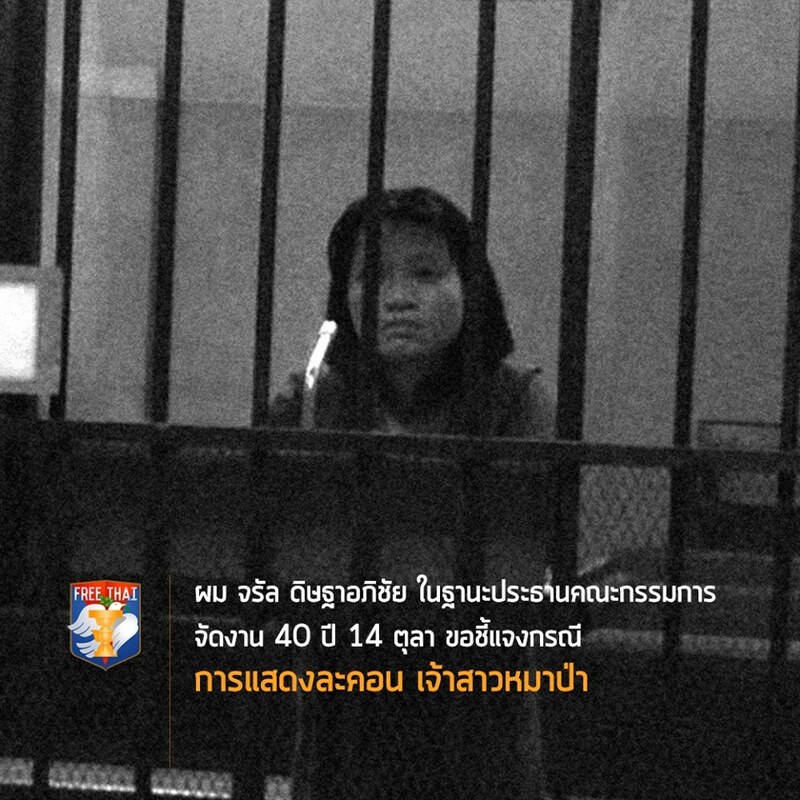 NCPO’s Selection of Prime Minister is only a political farce and in violation of the rule of law. 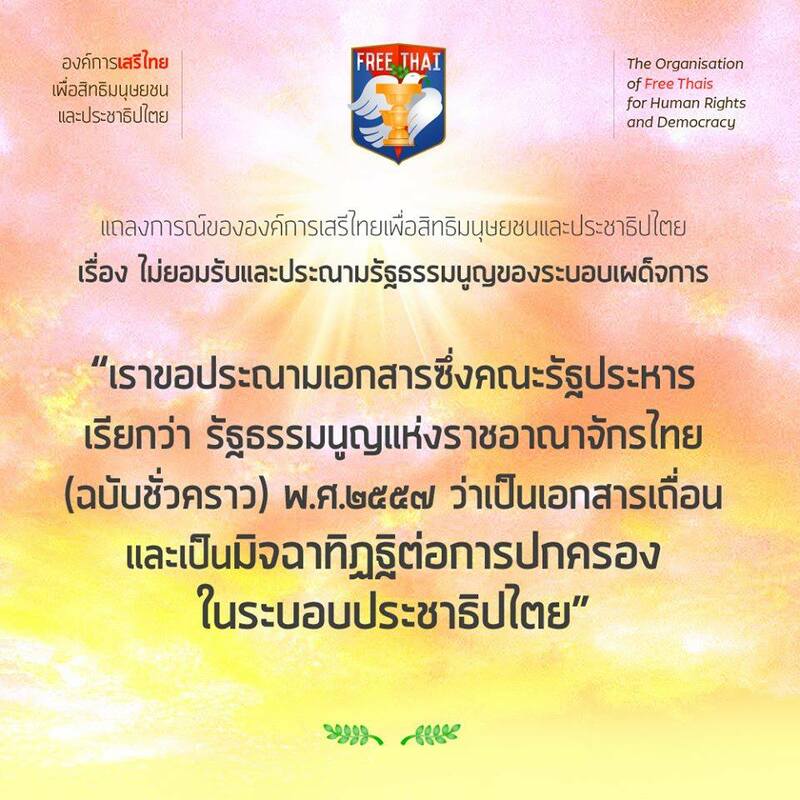 The Thai public and indeed the world is aware that members of “the National Legislative Assembly” were all hand-picked entirely at the pleasure of the dictator, Prayuth Chan-ocha, in order to select him as Prime Minister. This selection can never be justified or legitimised as a people’s decision. Even the process itself, with the nomination of one name for consideration, has been derided as a “rubber stamp” and brought international shame to our country. We conclude that such a political disgrace is the worst form of political kick-back. 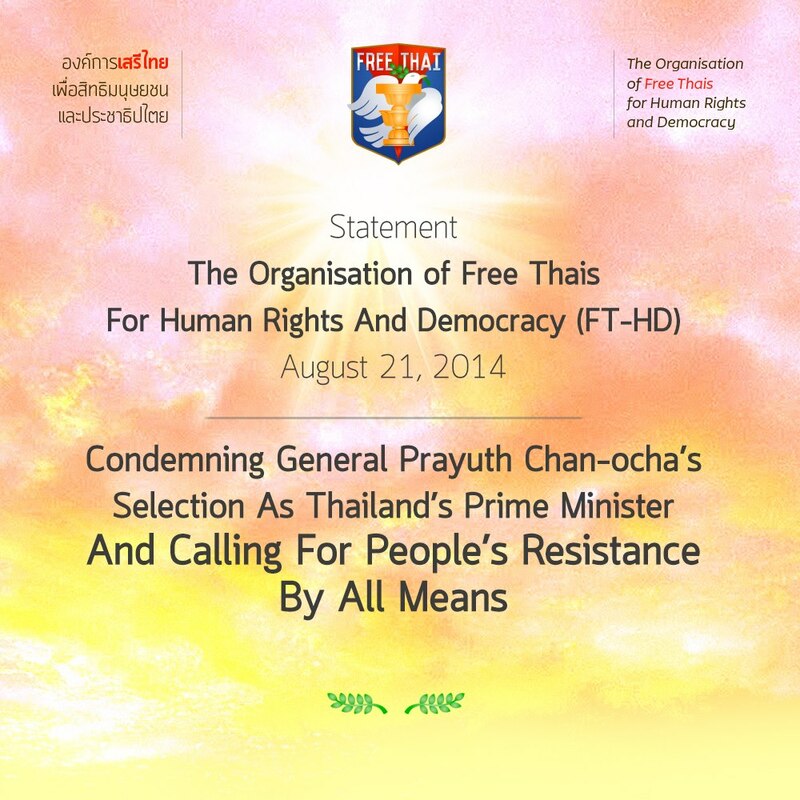 For the aforementioned reasons, FT-HD asks all democracy lovers, both in Thailand and abroad, to condemn and resist the selection of General Prayuth Chan-ocha as Thailand’s new Prime Minister, and to go against the entire regime in every way and in various forms. 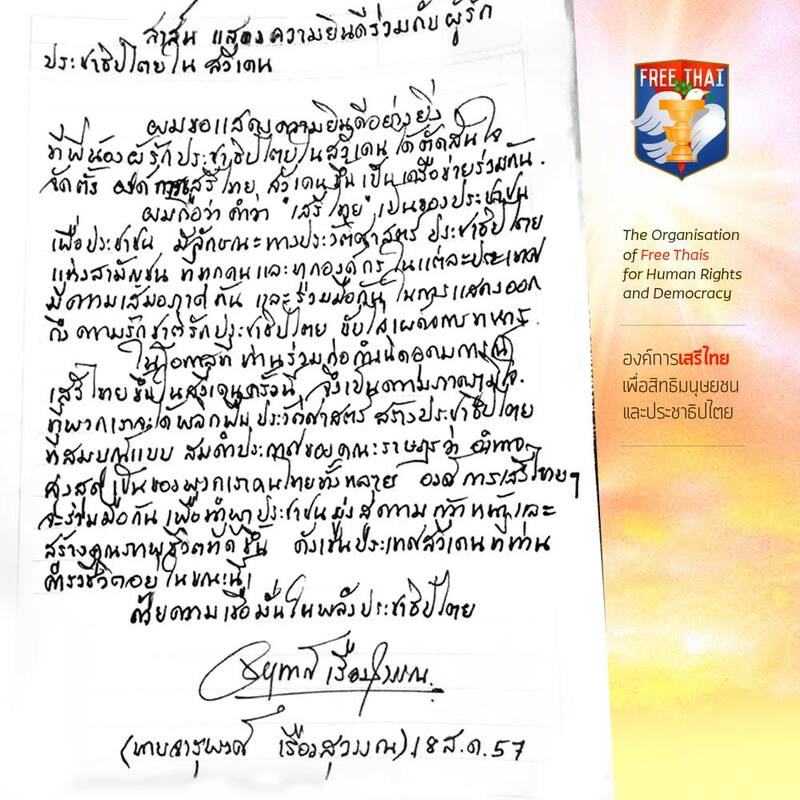 We also call for written messages explaining the negative repercussions of this abuse of power to the development and progress of Southeast Asia’s democratisation and the undermining of foreign investment and free-market development, and have it sent to respective ministries of foreign affairs, embassies, and / or diplomatic offices around the world. We the FT-HD firmly believe that a regime not from the people will never have people’s interests at heart.